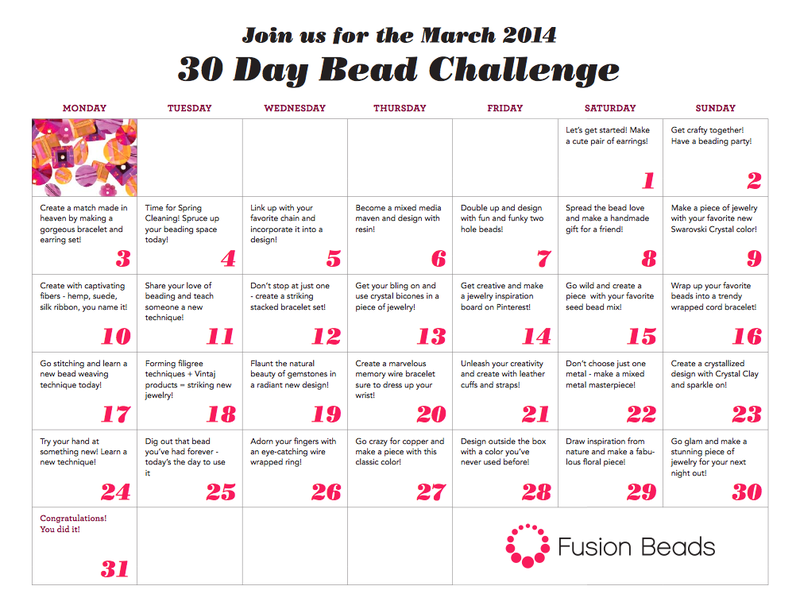 It's hard to believe that the Fusion Beads 30 Day Bead Challenge is halfway over! This series of creative exercises to celebrate National Craft Month has been really fun and kicked my creativity into overdrive! Here's a recap of my participation for the first half of this month-long challenge! To find out more about how I addressed each of the prompts, click on the day and it'll take you to that day's post. It's not too late to jump in! And remember, this is a self-directed challenge, so you can skip around and select the prompts that appeal to you most! You don't have to move in a linear fashion. I personally like the total immersion process, tackling projects day by day... it's sort of like beading boot camp. It's a little bit trickier, but it forces you to plan ahead and adjust ideas to make them more realistic and doable. CLICK HERE for the full calendar! And if you're playing along, I'd love to see what you're making! If you have a moment, comment on this post with links to some of your favorite creations made for this challenge! Nothing like a challenge to push us to create. But I'm blown away by how productive you've been and that each piece is so unique. Not one looks like like you dashed it off just to meet a deadline. Fabulous, Andrew!